Svoboda supporters march in Kiev during the Maidan protests. Flickr/Slawekol. All rights reserved. Ternopol Mayor Sergei Nadal was asked why Svoboda supports the recognition of descendants of former members of the Ukrainian 14th Division of the Waffen SS as national heroes. "These Ukrainian heroes must be honoured irrespective of what has been written about them in the history books of those peoples who were once our enemies," Nadal answered. The current crisis in Ukraine affects Poland perhaps more than any other European country. Poland and Ukraine share a common border and are economically, culturally and historically entwined. Large areas of western Ukraine belonged to Poland before the war and cities such as Lviv continue to be seen by many Poles as central to their cultural heritage. About 1/5 of all the country’s exports go eastwards to Ukraine and Russia; and hundreds of thousands of jobs depend on this eastern trade. Ukraine is also a country of particular strategic importance for a government that bases its foreign policy on the pre-war conception of having buffer states to its east that are independent of Russia. Anyone who understands Polish history and society would have expected it to have taken a firm stance against Russia in this crisis. However, this has been accompanied by an overall silence on the role played by the far-right in Ukraine. And there is much for Poland to be concerned about. 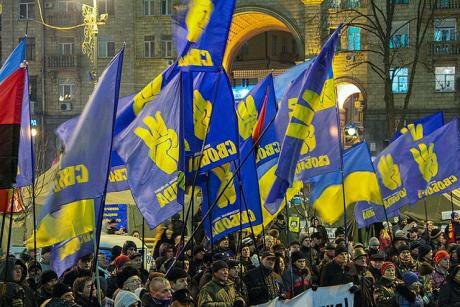 The far-right organisations Svoboda and the Right-Sector played a central role in the Maidan protests, which increased as they became more radical and violent. Although the far-right was a minority on the Maidan demonstrations, their reputation and prestige rose as they were at the forefront of fighting with the hated Berkut. These parties have strong neo-Nazi roots and connections to other fascist parties in Europe. They also openly display the black and red flags of UPA and portraits of Bandera (one such banner was hung in Kiev's town hall). They are organised on the streets and are now strongly embedded in Ukraine’s new government alongside the supporters of the west’s favourite oligarch Yulia Tymoschenko. Seven Ministries in this government are occupied by the far-right (including defence and national security) and they have four Regional Governors.